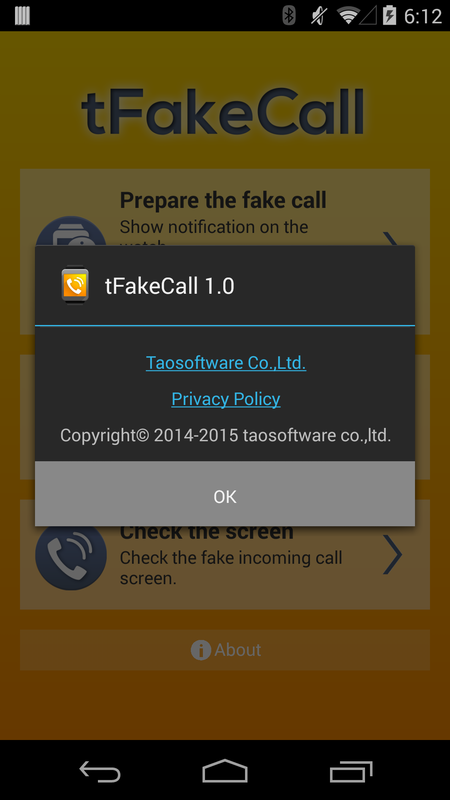 "tFakeCall" is an app that can make fake incoming call by controlling a smartwatch from smartphone. Have you ever thought you would like to escape from a boring meeting, tedious conversation or party? 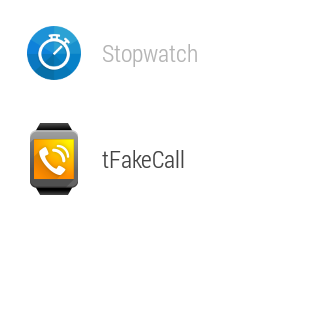 Using "tFakeCall", It is possible to behaves as if you received a telephone call when you tap on your Android Wear. Once you have that convenience, you can slip out from the situation without being party pooper. You can run even there is your smartphone in the pocket or on the desk, because it is begins operation on the watch. 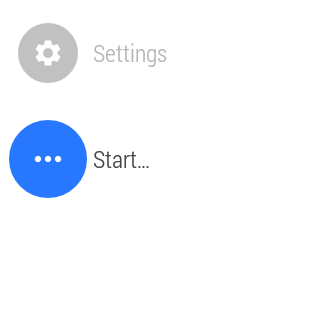 Please keep in mind that you need Android wear to run it because this app uses connection between the compatible watch (Android Wear) and smartphone. Operating the watch, and make a fake call. Please refer to "Operating procedure". Set the waiting time between the times you tap the notification on your watch and the fake call goes off. Browse the fake incoming call screen. To display a notification on the top screen of the smartwatch. 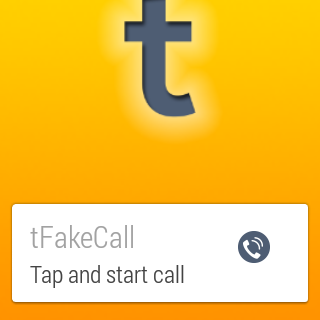 Only tapping the notification, you can start a fake call. It will be easier to set up beforehand for the situation you might want to slip out. To view the notice, there are two ways. 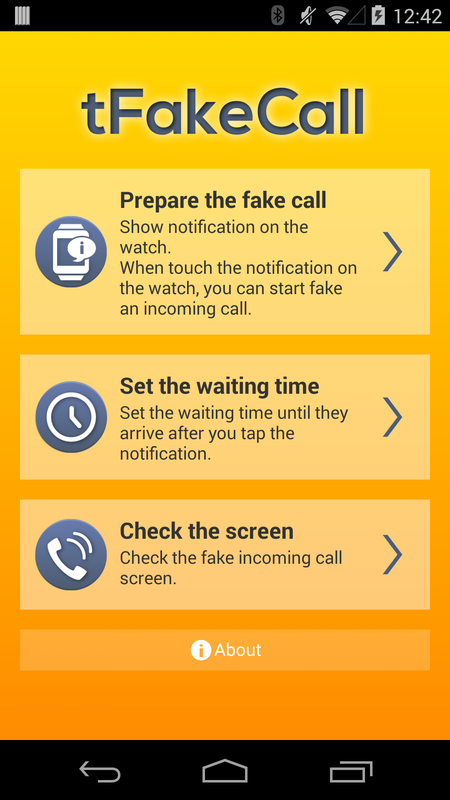 Launch "tFakeCall" on the smartphone → Tap to "Prepare the fake call"
Touch the smartwatch → Tap the "Start..." → Choose "tFakeCall"
Tap the notification on the watch at the timing when you want to make a fake call. You may tap the notification on your watch secretly not to get noticed by others. When the waiting time elapsed, the fake call goes off. Tell people around you got a call and need to go. The vibration and ringtone will go off as it set as in smartphone. When the setting is no sound and no vibration then it does not work so well. Press Answer to display fake talking screen. Press Decline (End Call in fake talking screen) to display home screen. 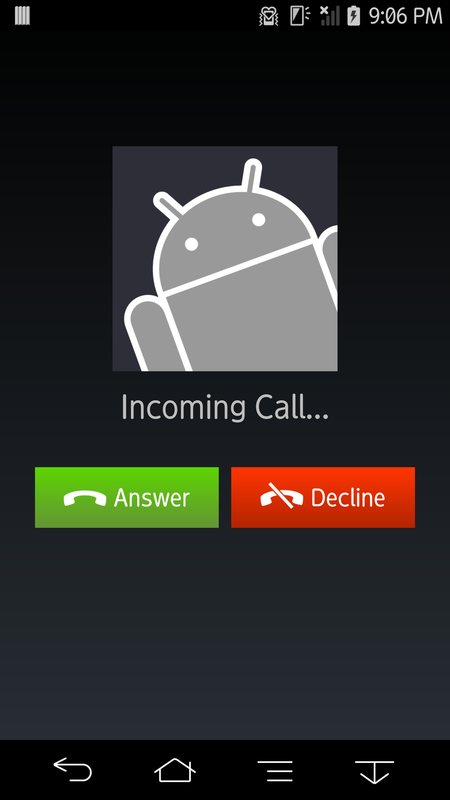 When you start a tFakeCall, this screen below appears. To display a notification on the top screen of the smartwatch, you tap the "Prepare the fake call". 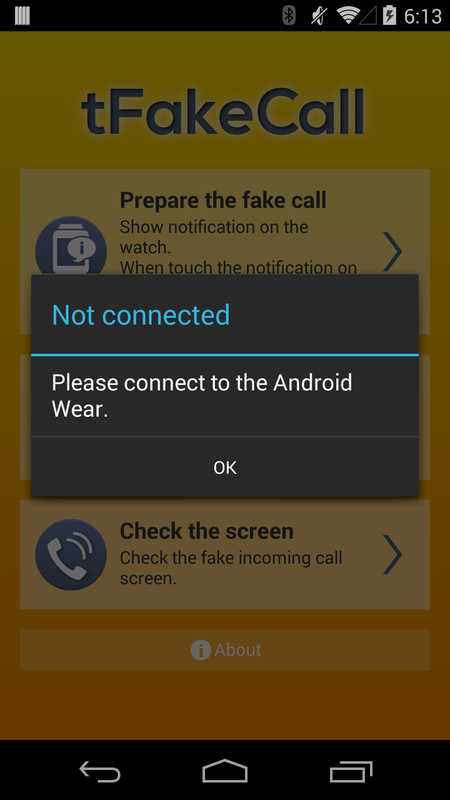 If your watch (Android Wear) is unconnected to the smartphone at that time, the display tells you "Please connect to the Android Wear". 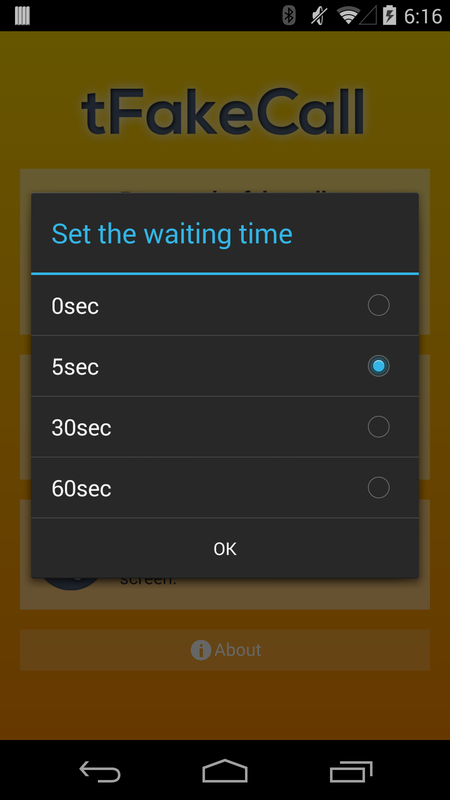 Set the waiting time between the times you tap the notification and fake call goes off. The default setting is 5 seconds. There are four different choices, 0 seconds, 5 seconds, 30 seconds and 60 seconds. Please choose to match the available scene. 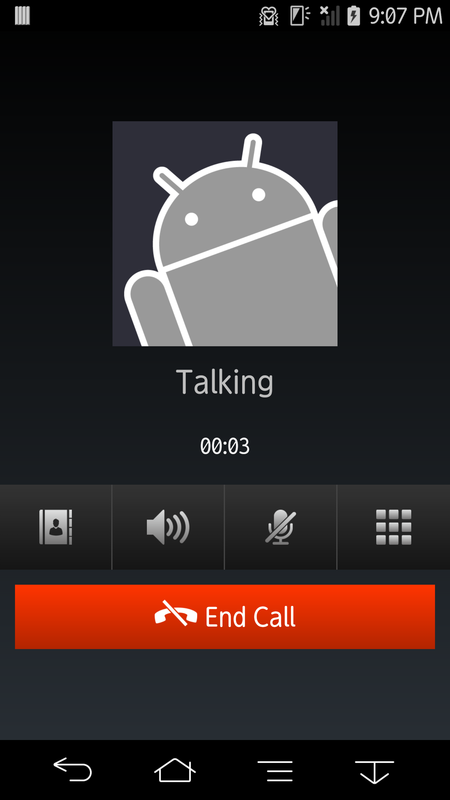 You can browse the fake incoming call screen. 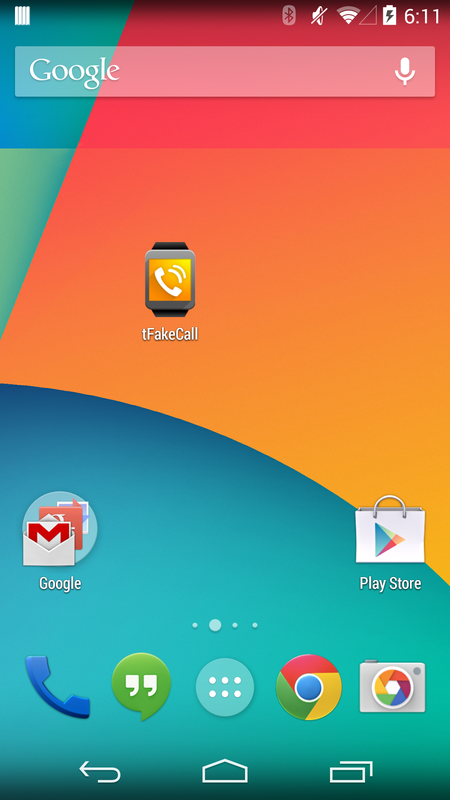 When you tap the "Prepare the fake call" on main screen of smartphone, this notification displays. Please refer to Operating procedure, if you'd like to display this notice from watch operation. 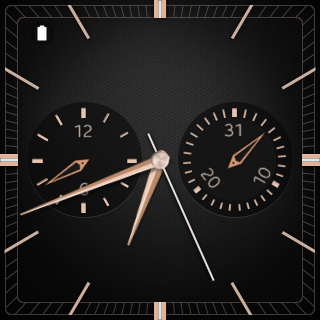 This notification displays when smartphone and watch are disconnected. 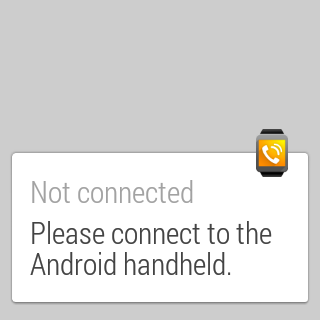 If it is displayed, please connect them using the Android Wear app. Download from Android Market "Apps" -> "Productivity"
You expressly acknowledge and agree that use of the Software is at your sole risk. The Software and related documentation are provided "AS IS" and without warranty of any kind and Taosoftware EXPRESSLY DISCLAIMS ALL WARRANTIES, EXPRESS AND IMPLIED, INCLUDING, BUT NOT LIMITED TO, THE IMPLIED WARRANTIES OF MERCHANTABILITY AND FITNESS FOR A PARTICULAR PURPOSE. TAO SOFTWARE DOES NOT WARRANT THAT THE FUNCTIONS CONTAINED IN THE SOFTWARE WILL MEET YOUR REQUIREMENTS, OR THAT THE OPERATION OF THE SOFTWARE WILL BE UNINTERRUPTED OR ERROR-FREE, OR THAT DEFECTS IN THE SOFTWARE WILL BE CORRECTED. THE ENTIRE RISK AS TO THE RESULTS AND PERFORMANCE OF THE SOFTWARE IS ASSUMED BY YOU. FURTHERMORE, TAO SOFTWARE DOES NOT WARRANT OR MAKE ANY REPRESENTATIONS REGARDING THE USE OR THE RESULTS OF THE USE OF THE SOFTWARE OR RELATED DOCUMENTATION IN TERMS OF THEIR CORRECTNESS, ACCURACY, RELIABILITY, CURRENTNESS, OR OTHERWISE. NO ORAL OR WRITTEN INFORMATION OR ADVICE GIVEN BY TAO SOFTWARE OR TAO SOFTWARE'S AUTHORIZED REPRESENTATIVE SHALL CREATE A WARRANTY OR IN ANY WAY INCREASE THE SCOPE OF THIS WARRANTY. SHOULD THE SOFTWARE PROVE DEFECTIVE, YOU (AND NOT TAO SOFTWARE OR TAO SOFTWARE'S AUTHORIZED REPRESENTATIVE) ASSUME THE ENTIRE COST OF ALL NECESSARY SERVICING, REPAIR OR CORRECTION. UNDER NO CIRCUMSTANCES INCLUDING NEGLIGENCE, SHALL TAO SOFTWARE, OR ITS DIRECTORS, OFFICERS, EMPLOYEES OR AGENTS, BE LIABLE TO YOU FOR ANY INCIDENTAL, INDIRECT, SPECIAL OR CONSEQUENTIAL DAMAGES (INCLUDING DAMAGES FOR LOSS OF BUSINESS PROFITS, BUSINESS INTERRUPTION, LOSS OF BUSINESS INFORMATION, AND THE LIKE) ARISING OUT OF THE USE, MISUSE OR INABILITY TO USE THE SOFTWARE OR RELATED DOCUMENTATION, BREACH OR DEFAULT, INCLUDING THOSE ARISING FROM INFRINGEMENT OR ALLEGED INFRINGEMENT OF ANY PATENT, TRADEMARK, COPYRIGHT OR OTHER INTELLECTUAL PROPERTY RIGHT, BY TAO SOFTWARE, EVEN IF TAO SOFTWARE OR TAO SOFTWARE'S AUTHORIZED REPRESENTATIVE HAS BEEN ADVISED OF THE POSSIBILITY OF SUCH DAMAGES. We make a customized development of software for Android. Please feel free to contact us for further inquiry. Copyright (C) 2005-2012 Taosoftware Co.,Ltd. All Rights Reserved.